High-Speed ​​Wireless Internet, Dampf, Vollständige Gourmet voll ausgestattete Küche, voll ausgestatteten Fitnessraum im Haus, voll möbliert und wirklich wunderbar! Ihr Zuhause fern von zu Hause aus. Perfekte Lage für Winter in Telluride oder Momente der Entspannung in der schönen Sommerzeit! Really enjoyed our stay! Cozy condo for a family of four. Once we parked we never got back in the truck until we left. Condo was clean and had everything we needed. 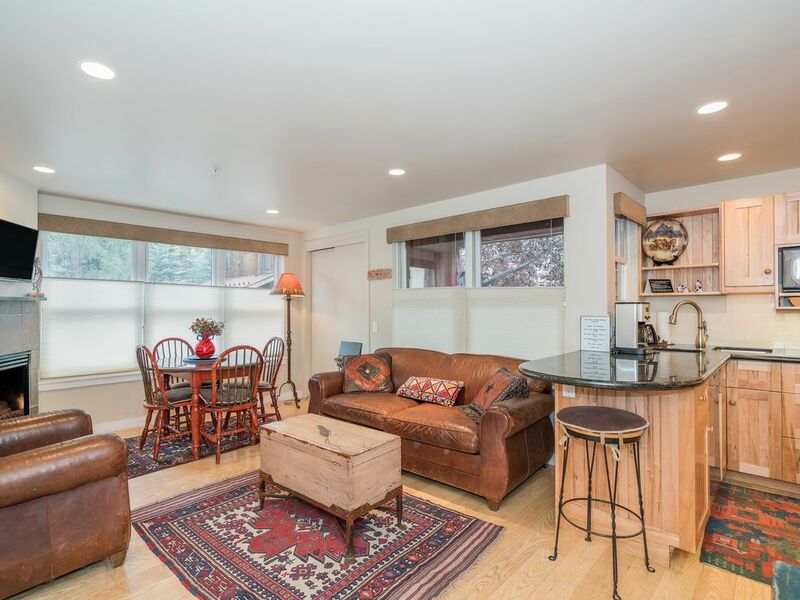 Easy walking distance to gondola, restaurants and shopping. Excellent property and location. I highly recommend the unit to smaller groups. Thank you for taking the time to leave a review for our Gold Panner's Alley condo. It is certainly is a cozy little two bedroom! Perfect for couples or real close group of friends. Thanks again and we hope to see you again soon! This condo was very clean, with a loaded kitchen and great location! We really enjoyed our stay. It's walkable to the gondola and the main area of town with restaurants and bars. It was very easy to work with the rental company and they were very helpful with the check-in and check out process and even gave us a later check out. Highly recommend this condo. Only small factor was that it is smaller than the pictures make it look but it was fine for two couples. Thank you for the review of Gold Panner's Alley condo. It is central located and a great cozy little condo. It is 855 sq feet total, so make sure you bring good friends or your family! We hope to see you all again next winter, or maybe this summer for a festival! Thank you for your review of the Madison Pacific condo!